Microsoft has given away tons of freebies to lure developers and users back to the Windows 10 platform: albums, movies, even the operating system itself. Now you can add one of the most popular Xbox One games: the Forza series, specifically the Windows 10 exclusive Forza Motorsport 6: Apex. Set to debut this spring, Forza Apex is a free, “curated experience” of Forza Motorsport 6, the latest game by Microsoft’s in-house developer, Turn 10. Microsoft promises the game will be totally free. There may be microtransactions, but they won’t be necessary to experience the full scope of the game. There will be no ads, either, the developers said. 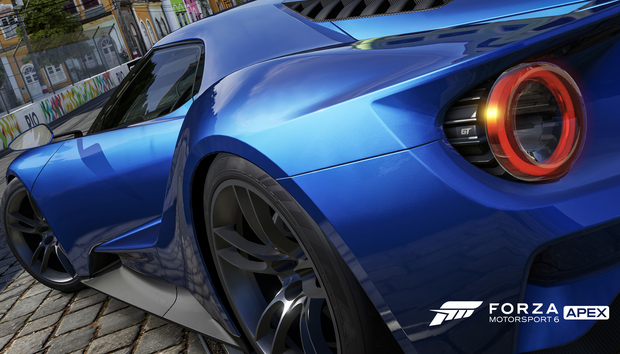 Instead, you’ll get a slice of Forza, optimized for Windows 10 and DirectX 12. Turn 10 promises you’ll work through 12 “stories of motorsport lore,” which will include a race symbolizing the rivalry between Ferrari and Lamborghini, for example. Turn 10 promises you’ll experience six environments, 20 track layouts, and race up to 60 cars, at launch. Even if you own Forza 6, what you’ll see on the 12-event showcase tour will be “wholly unique to Apex,” according to Andy Beaudoin, design director at Turn 10. You’ll see the same sort of lifelike car interiors in Forza Apex as you’ll see in other Forza games. The story behind the story: Behind the scenes, however, there’s a complicated business proposition playing out. Forza Apex will be featured within the Windows Store within Windows 10, an app store that’s been notoriously light on big-budget titles. It's also one of the first titles to use DirectX 12 an API that Microsoft would like to more developers to adopt. If you’re already a PC gamer, Apex just might convince you to adopt an Xbox Live gamertag and possibly carry over any achievements you earn into the Xbox One world. Make no mistake about it: Microsoft is tapping what has been an Xbox-only franchise to beef up its Windows offerings. Because Turn 10 is a wholly owned subsidiary, it will receive opportunities that other developers don’t have. In Forza Motorsport 6L Apex, you’ll have a chance to explore several “tours” of the sport. “The best way to think about Apex is our first step in a commitment, as a franchise and as a platform, towards Windows 10 and PC gamers,” Beaudoin said. According to Phil Spencer, the head of the Xbox and gaming business for Microsoft, Microsoft isn’t as concerned with outselling the Sony PlayStation 4. Instead, the company wants to present the Xbox as a platform gamers play and play again—the Monthly Active User metric that apps are obsessed with. That should be good news for Apex owners, as Turn 10 is committed to updating the game and adding new content, Beaudoin said. Forza Apex maintains the same look and feel of Forza Motorsport: 6. Turn 10 hasn’t released any minimum specs for the game. Given the graphical complexity of the Xbox One version, you probably shouldn’t expect an older PC with integrated graphics will be able to run Apex. Still, Microsoft wants you on Windows 10, and it wants you to buy Windows games. If it throws a few freebies your way to do so, then that’s good, right?